The 1980 United States House of Representatives elections was an election for the United States House of Representatives in 1980 which coincided with the election of Ronald Reagan as President. 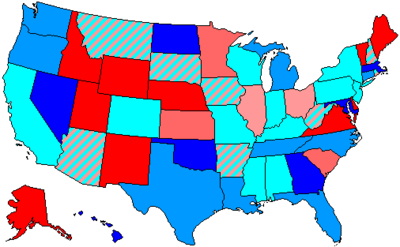 Reagan's victory also allowed many Republican House candidates to secure election, and the Republicans gained a net of 35 seats from the Democratic Party. The Democrats nonetheless retained a significant majority, unlike the Senate elections, where Republicans gained control of the chamber. However, many Democratic congressmen from the south (known as "Boll weevils") frequently took conservative stances on issues, allowing Republicans to have a working ideological majority for some of President Reagan's proposals during his first two years in office. This election marked the first time since Reconstruction that Republicans won a sizable majority of Representatives from a Deep South state (South Carolina). It was also the first time that the new Libertarian Party received the third-largest share of the popular vote in both chambers of Congress. 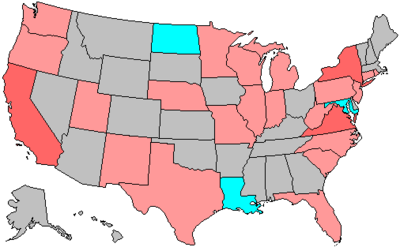 In these special elections, the winner was seated during 1980 or before January 3, 1981; ordered by election date. Illinois 10 Abner Mikva Democratic 1968, 1970, 1972 (Lost), 1974, 1976, 1978 Incumbent resigned September 26, 1979, to become Judge of the U.S. Court of Appeals. New member elected January 22, 1980. Pennsylvania 11 Daniel J. Flood Democratic 1944, 1946 (Lost), 1948, 1950, 1952 (Lost), 1954, 1954, 1958, 1960, 1962, 1964, 1966, 1968, 1970, 1972, 1974, 1976, 1978 Incumbent resigned January 31, 1980, after being censured by the U.S. House. New member elected April 9, 1980. Louisiana 3 Dave Treen Republican 1972, 1974, 1976, 1978 Incumbent resigned March 10, 1980, to become Governor of Louisiana. New member elected May 22, 1980. West Virginia 3 John Slack Democratic 1958, 1960, 1962, 1964, 1966, 1968, 1970, 1972, 1974, 1976, 1978 Incumbent died March 17,1980. New Member elected June 3, 1980. Michigan 13 Charles Diggs Democratic 1954, 1954, 1958, 1960, 1962, 1964, 1966, 1968, 1970, 1972, 1974, 1976, 1978 Incumbent resigned June 3, 1980, after being censured by the U.S. House. New member elected November 4, 1980. Alabama 6 John Hall Buchanan Jr. Republican 1964 Incumbent lost renomination. California 1 Harold T. Johnson Democratic 1958 Incumbent lost re-election. California 11 William Royer Republican 1979 (Special) Incumbent lost re-election. California 21 James C. Corman Democratic 1960 Incumbent lost re-election. California 31 Charles H. Wilson Democratic 1962 Incumbent lost renomination. California 35 James F. Lloyd Democratic 1974 Incumbent lost re-election. California 41 Bob Wilson Republican 1952 Incumbent retired. California 42 Lionel Van Deerlin Democratic 1962 Incumbent lost re-election. Colorado 4 James Paul Johnson Republican 1972 Incumbent retired. Connecticut 2 Chris Dodd Democratic 1974 Incumbent retired to run for U.S. Senator. Connecticut 3 Robert Giaimo Democratic 1958 Incumbent retired. Florida 5 Richard Kelly Republican 1974 Incumbent lost renomination. Florida 12 Edward J. Stack Democratic 1978 Incumbent lost renomination. Georgia 2 Dawson Mathis Democratic 1970 Incumbent retired to run for U.S. Senator. Idaho 1 Steve Symms Republican 1972 Incumbent retired to run for U.S. Senator. Illinois 1 Bennett M. Stewart Democratic 1978 Incumbent lost renomination. Illinois 2 Morgan F. Murphy Democratic 1970 Incumbent retired. Illinois 16 John B. Anderson Republican 1960 Incumbent retired to run for U.S. President. Indiana 3 John Brademas Democratic 1958 Incumbent lost re-election. Indiana 4 Dan Quayle Republican 1976 Incumbent retired to run for U.S. Senator. Iowa 3 Chuck Grassley Republican 1974 Incumbent retired to run for U.S. Senator. Kansas 1 Keith Sebelius Republican 1968 Incumbent retired. Kentucky 5 Tim Lee Carter Republican 1964 Incumbent retired. Louisiana 4 Buddy Leach Democratic 1978 Incumbent lost re-election. Maryland 1 Robert Bauman Republican 1973 (Special) Incumbent lost re-election. Massachusetts 4 Robert Drinan Democratic 1970 Incumbent retired. Michigan 6 Milton Robert Carr Democratic 1974 Incumbent lost re-election. Michigan 13 Charles Diggs Democratic 1954 Incumbent resigned June 3, 1980, after being censured by the U.S. House. Michigan 14 Lucien Nedzi Democratic 1961 (Special) Incumbent retired. Minnesota 6 Richard Nolan Democratic 1974 Incumbent retired. Missouri 8 Richard Howard Ichord Jr. Democratic 1960 Incumbent retired. Missouri 10 Bill Burlison Democratic 1968 Incumbent lost re-election. Nebraska 2 John Joseph Cavanaugh Democratic 1976 Incumbent retired. New Hampshire 2 James Colgate Cleveland Republican 1962 Incumbent retired. New Jersey 4 Frank Thompson Democratic 1954 Incumbent lost re-election. New Jersey 7 Andrew Maguire Democratic 1974 Incumbent lost re-election. New Jersey 15 Edward J. Patten Democratic 1962 Incumbent retired. New Mexico 2 Harold L. Runnels Democratic 1970 Incumbent died. New York 3 Jerome Ambro Democratic 1974 Incumbent lost re-election. New York 5 John W. Wydler Republican 1962 Incumbent retired. New York 6 Lester L. Wolff Democratic 1964 Incumbent lost re-election. New York 16 Elizabeth Holtzman Democratic 1972 Incumbent retired to run for U.S. Senator. New York 17 John M. Murphy Democratic 1962 Incumbent lost re-election. New York 30 Robert C. McEwen Republican 1964 Incumbent retired. New York 32 James M. Hanley Democratic 1964 Incumbent retired. North Carolina 6 L. Richardson Preyer Democratic 1968 Incumbent lost re-election. North Carolina 11 V. Lamar Gudger Democratic 1976 Incumbent lost re-election. North Dakota at-large Mark Andrews Republican 1962 Incumbent retired to run for U.S. Senator. Ohio 6 Bill Harsha Republican 1960 Incumbent retired. Ohio 9 Thomas L. Ashley Democratic 1954 Incumbent lost re-election. Ohio 12 Samuel L. Devine Republican 1958 Incumbent lost re-election. Ohio 22 Charles Vanik Democratic 1954 Incumbent retired. Oklahoma 4 Tom Steed Democratic 1948 Incumbent retired. Oregon 2 Albert C. Ullman Democratic 1956 Incumbent lost re-election. Oregon 3 Robert B. Duncan Democratic 1974 Incumbent lost renomination. Pennsylvania 1 Michael Myers Democratic 1976 Incumbent lost re-election. Pennsylvania 8 Peter H. Kostmayer Democratic 1976 Incumbent lost re-election. Pennsylvania 11 Ray Musto Democratic 1980 Incumbent lost re-election. Pennsylvania 14 William S. Moorhead Democratic 1958 Incumbent retired. Rhode Island 2 Edward Beard Democratic 1974 Incumbent lost re-election. South Carolina 1 Mendel Jackson Davis Democratic 1971 (Special) Incumbent retired. South Carolina 6 John Jenrette Democratic 1974 Incumbent lost re-election. South Dakota 2 James Abdnor Republican 1972 Incumbent retired to run for U.S. Senator. Texas 4 Ray Roberts Democratic 1962 Incumbent retired. Texas 8 Robert C. Eckhardt Democratic 1966 Incumbent lost re-election. Texas 14 Joseph P. Wyatt, Jr. Democratic 1978 Incumbent retired. Utah 1 K. Gunn McKay Democratic 1970 Incumbent lost re-election. Virginia 3 David E. Satterfield III Democratic 1964 Incumbent retired. Virginia 8 Herbert Harris Democratic 1974 Incumbent lost re-election. Virginia 10 Joseph L. Fisher Democratic 1974 Incumbent lost re-election. Washington 4 Mike McCormack Democratic 1970 Incumbent lost re-election. West Virginia 2 Harley O. Staggers Democratic 1948 Incumbent retired. West Virginia 3 John G. Hutchinson Democratic 1980 Incumbent lost re-election. Wisconsin 3 Alvin Baldus Democratic 1974 Incumbent lost re-election.